Summary: The Night of the Wolf. On the Avenue in the bleak area where New York City blends into suburbia, the Orphans, their fast Fords and their Chevys ‘coated by ice and leather and white dust’, prepare to engage in deadly, intricately structured games of combat. It is a world of grotesque, horrifying violence, fear, bravado and drugs, redeemed in the minds of its inhabitants by codes of honour, by chivalrous intentions and by the purity of their struggle for power, dominance, territory. This is the setting of Alice Hoffman’s unsparing and unsentimental novel. Her heroine, 17 years old, quick witted yet vulnerable, falls helplessly in love with McKay, the Orphan’s 22 year old president and their doomed love story is told in desperate counterpoint to the punk lyrical flippancies of throbbing car radios and jukes. This one took me by surprise. I am a huge fan of Ms. Hoffman’s work, especially her young-adult work. I picked this up before my Paris trip, as one of my books for the whole “reading every adult fiction book you have not read on your bookshelves (but not on your floor or closets)” project that me and Ms. Narwhal Love and Lit have decided to do together. This was my second book (I failed in the first one). It was such a different story from what I was used to with her other work, but at the same I could sense that it was her book, just by the way she wrote the story. 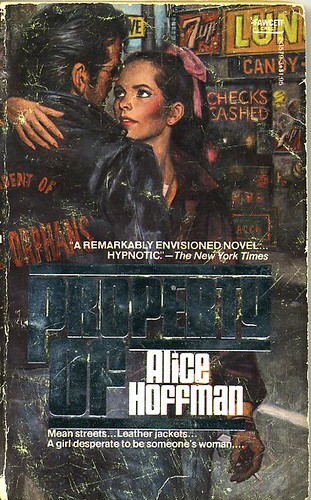 This was Alice Hoffman’s first book and even though the subject matter took me by surprise (gangs? ), I was very much taken by the nameless-heroine and her quest to change McKay for the better, but then realizing that there was no hope for him, after some glimmers of hope. The whole time I was thinking “Come on, just leave him! Just do it!” I figure if I get all riled up while reading a book, then the author must be doing something right. The summary above pretty much says it all. The nameless heroine gets involved with McKay, but is adamant about never becoming “property”, like the other girlfriends of the gang members. She loves McKay and even though McKay never out right tells her that he loves her back, you have a sense that he does care for her, even if he sleeps around. After a confrontation with the rival gang of the streets, the lovers’ world starts to fall apart, mostly due to McKay’s own doing. Towards the end, there is some hope for them, but then ultimately, our nameless heroine has to make a final choice …a choice that can only involve her. I have to admit, I did not like McKay. He was too high-and-mighty about this whole “honor” stuff. It totally blinded him to reality, which made you want the heroine to leave him even more. So why did she even stay with him? I’m not entirely sure, but I have a feeling she wanted to be linked to the Orphans (something that she grew up with) and have someone to love. Ultimately, I think she stayed with McKay to change him for the better, but that was clearly not working out. On another note, I did want to learn more about the drunken deli owner who would give his versions of stories and legends. He was quite the interesting character. Really enjoyed his scenes. So, in the end, did I like it? Yes. Would I recommend it? Yes, only if you’re looking to see where Ms. Hoffman started and to get a glimpse of something different than what is being written today. Oh, and check out that first cover. Makes it look a tiny bit “pulpy” don’t you think? My edition was different. Also a mass market edition, with the leather jacket, and no people in it. I honestly can’t remember where I even picked it up from. These industries need to consider more than just immediate damage to the structures. Institute at Lightningsafety. The great thing is that you don’t have to drink coffee or take any stimulants to get this boost.